She began her cello studies at the age of four. Beth Silver is thrilled to be part of a community in which she can thrive on her intuition and creativity. She has performed on stages across Canada, the United States, Europe, Israel and China, as a soloist, chamber and orchestral musician. 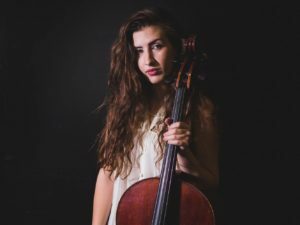 A recent graduate of McGill’s Master’s program, she was a student of Matt Haimovitz, with whom she was invited to play as part of his all-cello group Uccello. She obtained her Bachelor degree from the University of Toronto, where she studied with Shauna Rolston. Her past teachers also include Chloe Dominguez, Rachel Mercer, Simon Fryer, Barbara Pepper and Wendy Smith. Beth was the 2014 recipient of the Ben Steinberg Musical Legacy Award, recognizing musical achievement in the Canadian Jewish community.